Conflict in Syria has led to a profoundly urban crisis. Damage, destruction and displacement are concentrated in major urban centres and cities. Gathering information to better understand their impact on urban areas and the people living in them, is a delicate task. Limited access to populations and cities, and lack of first hand contextual knowledge were just some of the key challenges that partners encountered during the data collection and analysis phase that informed the city profiles and context reports, being produced through the Urban Analysis Network | Syria (UrbAN-S) project. 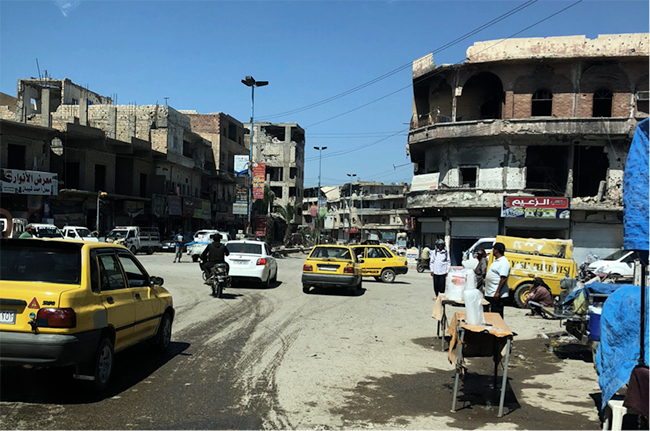 The UrbAN-S is a consortium of partners that was set up in 2018 to provide up-to-date and comprehensive analyses of critically affected cities in Syria. JIPS led the development of the Urban Profiling Toolkit (soon available online), a methodology and set of tools that guided the data process. We are currently also working on an urban profiling training planned for later this year. Ola Samarah undertook remote debriefing sessions with field teams collecting data in Syria. JIPS: Hi Ola, please tell us a bit about yourself. Over the years, I have observed a rapid transformation of the Jordanian capital, partly due to urbanisation and environmental change, but also more recently due to population movements and the arrival of refugees. I think displacement sparked an “identity crisis” in Amman, and this impacted how the city managed its spaces and infrastructure, and the needs of its residents and new arrivals. This crisis is what led me to move away from architecture and design, and concentrate on urban research and analysis. I wrote my masters’ thesis on how displaced populations and their host communities adapt their physical space to their social and cultural needs. I then worked with international NGOs and the Queen Rania Foundation, before I joined iMMAP and the UrbAN-S project, where I contributed to the development of the methodology and tools, and remotely oversaw the data collection pilot in the cities of Deir-ez-Zhor and Raqqa. JIPS: What does an urban profiling produce and how is it useful for governments, development and humanitarian actors in the Syrian context? The very first question we often hear from the different actors we meet from the international community is: ‘where can we start from?’ I believe the city profiles provide an integrated snapshot of the situation accompanied with a series of entry points that can inform short, medium or long-term humanitarian and development investments. The profiles do this by describing the current physical and social conditions both at the level of the neighbourhood and the city, and put these in the context of the conflict and the displacement situation. This integrated approach produces evidence on areas or neighbourhoods in dire need of intervention, but also tells actors how the challenges in these areas are interconnected across different sectors, including infrastructure, governance, HLP and economy. Because of the latter, the profiles can also initiate discussions among actors from different fields and sectors, and encourage them to coordinate better and work in joint programming. A city profile explained. The map provides an overview of cities to be profiled in 2019 – 2020. Visit https://urban-syria.org/ for more information. JIPS: Do you think this urban profiling approach developed specifically for Syrian cities can be used in other urban settings? Yes, definitely. The designed approach is flexible and can be adapted to different contexts. The methodology is based on an analytical framework that looks at urban recovery in an integrated manner, considering different aspects that can be found in any city in crisis. The approach is particularly suited for contexts where access is restricted and damage extensive, but the framework provides a solid foundation that can then be adapted to different types of cities, depending on the nature of the conflict and displacement situation. JIPS: You were working closely with us on the development of the methodology and tools that later guided the data collection. What were the main challenges involved in elaborating these materials? The main challenge was the lack of first hand knowledge at the beginning of the data collection, the distance that separated us from the real context. I’m not only talking about the complexity of the country and the conflict, but also about the complexity of each and every one of the cities, and sometimes even at the level of individual neighbourhoods. Hence, to adapt the framework and plan the data collection accordingly in each city we had to use alternative methods. What we did is, we conducted initial orientation sessions and through mapping and key informant interviews – with service providers, community members, NGO workers, urban planners, etc. – collected anecdotal data and first hand information from people and experts who lived in a specific city or neighbourhood. For example, in Homs, orientation sessions with local experts before the data collection helped us better understand how the city was spatially organised. It also made us realise that some neighbourhoods required deeper analysis, due to their strategic location, social fabric, land ownership, or ongoing interventions that may affect them disproportionally. Working with data in the humanitarian sector for a long time can sometimes make data collectors and analysts forget that numbers are much more than that: they are devastated lives. They are people, they are children. There’s a human dimension to the numbers that we are dealing with. JIPS: You were also involved in developing the training for enumerators who then went out to collect the data. How was this done in the specific context of Syria? The modality was a “Training of the Trainers”, so for field supervisors who then trained enumerators. Due to the limited access we had, I only had the chance to meet the field supervisors in Gaziantep, Turkey, but didn’t get to work with the enumerators directly – to me, that would have been more important, because they’re doing the actual field work. On technical aspects directly related to data collection: making sure [field supervisors] understood the different tools and field manuals and how to use them, how to identify respondents, how to assess the respondent’s reliability and credibility, tips on conducting interviews, and most importantly, how to answer the observation-based questions (damage levels). On building trust with them: I only had very limited time to build a trust relationship in order to motivate them to collect information that really reflected the situation in Syrian cities. Enumerators were trained to identify damage levels of different infrastructure assets through observation, thus complementing assessments made through remote sensing. I also invested time in explaining to field supervisors why we were doing this profiling exercise and the future use of the results. This was critical to make them feel included, but also so that they understood the importance of the project. People in general underestimate the value of data collection and analysis – especially since here we were talking about medium and long-term solutions for urban recovery and not quick wins. The additional debriefing sessions throughout the data collection process made sure everything was on track and helped to interpret the data within its context as accurately as possible. JIPS: You were using an area-based approach that used neighbourhoods as units of analysis and brought different sources and types of data – on population groups, infrastructure, damage and service – together. How did you make sense of all the data, and do you see a role for joint analysis in this process? In the same city, some neighbourhoods were completely damaged while others were functioning well. Though important, I don’t think that policies or programs crafted at the city level would be enough by themselves to inform sustainable recovery in cities. It was necessary that we analysed the neighbourhood level, and for doing so the area-based approach was very important. I believe this is the main strength of this profiling exercise: bringing information from different sources together, including quantitative and qualitative, and making sense of them at both neighbourhood and city level. This mixed methods approach produces more elaborate profiles, allowing for a better understanding the different patterns of damage, population movements and services, and how they come together in an area-based approach. Joint analysis is very important to get to this comprehensive picture because it brings together different expertise, different perspectives, and different voices, which gave us a more in-depth understanding of the information. 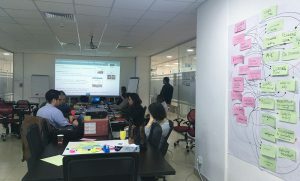 In the analysis, we would normally divide the sectors amongst the team and consortium based on each member’s expertise, and then we would bring the different pieces together through a joint analysis session. We would then consolidate all the information in order to be used for the development of urban recovery considerations at a later stage. JIPS: JIPS led the work on the methodology design and supported efforts to adapt the analysis plan to the Syrian context. What do you think was most useful of JIPS’ support? I think JIPS’ collaborative approach provided a very unique perspective to the whole process, especially on the toolkit (methodology, analysis plan questionnaires, interview forms, and indices), which is the skeleton of the project. Having worked with them closely, I believe JIPS did an impressive job in consolidating the methodology based on the complementary expertise and methods of the different consortium members. This included iMMAP’s expertise on information management, the European Commission Joint Research Centre (JRC) damage assessment based on remote sensing, the conflict analysis at city level led by Mercy Corps’ Humanitarian Access Team (HAT) and, of course, JIPS’ experience on protracted displacement and urban profiling. Workshop consolidating the methodology based on complementary approaches from consortium members, March 2018. JIPS: What would be your advice for partners collecting data in similar contexts? My first advice is to always remind the field team why we are doing this exercise and the intended use of the results. This way they’ll be motivated to collect real numbers. Unfortunately, working with data in the humanitarian sector for a long time can sometimes make data collectors and analysts forget that numbers are much more than that: they are devastated lives. They are people, they are children. There’s a human dimension to the numbers that we are dealing with. My second advice, particularly when managing a data collection process remotely, is to invest in building trust with the field team so that hey are comfortable in telling us the gaps, challenges, and limitations of the tools that we are using. This helps identify issues quickly and earlier in the process so that they can be addressed promptly, and contributes to increasing the confidence in our tools and ensure quality and reliability of the data. JIPS: What did you gain by being involved in this project as an urban researcher? Having to deal with the lack of access and the distance from the real context was an exceptional learning experience for me on a personal and professional level, equipping me with new skills and enhancing my perspective on the challenges of conducting research in conflict, heavily damaged or inaccessible areas. More importantly, this experience has given me the opportunity to contribute through meaningful data collection and urban analysis to inform future programming and reconstruction efforts for Syrian cities and its people. Would you like to share your experiences contextualising data collection in displacement situations? We would really like to hear about your work: get in touch at info@jips.org or find us on Facebook, Twitter, or LinkedIn.